Cisco has beat analysts' estimates for quarterly revenue and profit, as the network gear maker benefited from demand for its routers and switches as well as growth in newer areas of focus such as software. Shares of the company, which also forecast second-quarter revenue largely above expectations, rose four per cent in extended trading, putting them on track to add to a near 16 per cent gain for the year. Cisco pivoted to software and cyber security to cushion the impact from slowing demand for its routers and switches from companies increasingly shifting to cloud services offered by Amazon Web Services, Microsoft and Google instead of building their own networks. Revenue in its application software businesses rose 18 per cent to US$1.42 billion, beating analysts' average estimate of US$1.37 billion, according to data from Refinitiv. Sales in its security business, which offers firewall protection and breach detection systems, rose 11 per cent to US$651 million. That fell short of the IBES estimate of US$656.4 million, but beat research firm FactSet's estimate of US$648.1 million. Deals such as the US$2.35 billion purchase of cyber security provider Duo Security in August have played an important part in driving growth in Cisco's newer business. Acquisitions provided an 80-basis-point boost to the company's first-quarter results compared with a year ago, CFO Kelly Kramer said on a post-earnings call with analysts. Revenue in its infrastructure platform unit, which houses the switches and routers business, rose about 9 percent to $7.64 billion, topping expectation of $7.39 billion. Subscriptions, which provide a more steady revenue flow, accounted for 57 per cent of total software revenue in the first quarter, the company said. The preceding quarter's share was 56 per cent. "Cisco is executing on its plan to move its business model to software and subscriptions while benefiting from a strong IT spending environment," said Mark Cash, an analyst with Morningstar. 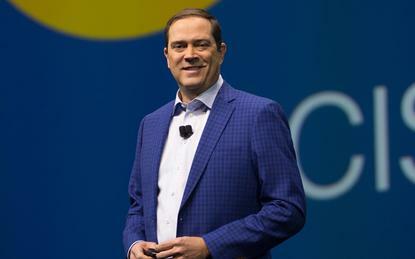 Cisco CEO Chuck Robbins said in an interview that the company was impacted by the Trump administration's 10 per cent tariffs on imports from China in the first quarter. "We implemented some price increases, as we said we would, and frankly, we didn't see any difference in the momentum before we did that and the momentum we saw after that in the quarter," Robbins told CNBC. "Obviously, we would prefer that the tariffs don't get increased to 25 per cent in January." Robbins also told CNBC he is hopeful that a solution could be reached over the U.S.-China trade dispute now that U.S. midterm elections are over. The company said it expects second-quarter revenue growth of between five per cent and seven per cent from a year earlier. This implies a range of between US$12.48 billion and US$12.72 billion, while analysts forecast US$12.53 billion. For its first quarter ended 27 October, the company posted an adjusted profit of 75 cents per share, above the average estimate of 72 cents. Total revenue rose 7.7 per cent to US$13.07 billion, topping estimate of US$12.87 billion. However, the company said deferred revenue fell 9.4 per cent to US$16.81 billion.